NVMStack is software-only and designed as high performance storage stack solution for All-Flash-Array. NVMe-oF DEMO app: Create a simple volume to get millions of IOPS. iSER Target command line Demo: Create quick demo by command line utils. 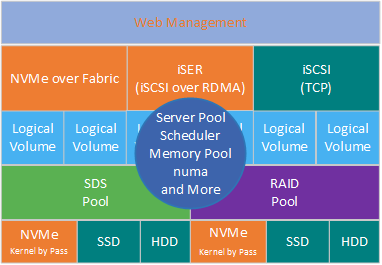 Connect NVMe Over Fabric subsystem from Linux. Configure NVMe over Fabric Active-Active HA by using multipath. Storage Pooled stack allows to create arbitrary, dynamic block volumes in thin provisioning and log structured. Linear scalability in performance and capacity.